Here's a nice write-up of this weekend's performances of Ivonne by West Edge Opera in Berkeley and San Francisco. Thanks especially to Marnie Breckenridge for her luminous voice and presence and to the musicians of Earplay New Chamber Music conducted by Mary Chun, for a marvelously subtle and precise performance. 3 months 1 day ago. This weekend, West Edge Opera will give the West Coast premiere of Ivonne, a monodrama about a Madmen-era head secretary whose regimented life is upended by an office tragedy. I wrote the piece, together with Jerre Dye, to be premiered inside the abandoned Sears Crosstown building, once the bustling hub of midtown Memphis… and in which Ivonne’s story actually took place… https://www.westedgeopera.org/snapshot-2019 3 months 1 week ago. Junkestra is in the expert hands of the Boston Percussion Group, who are giving the work’s New England premiere tomorrow at Pindrop. It should be an authoritative performance as two of BPeGs members, Brian Calhoon and Greg Simonds, were part of the original Junkestra crew in SF and are featured on the original innova Recordings recording. Wish I could be there! https:/www.aeronautbrewing.com/pindrop/ 3 months 2 weeks ago. In preparation for the new year, I needed to clean behind the piano, so, from today through Saturday December 22, I have moved my entire studio to THE INSTITUTE OF advanced UNCERTAINTY where I am spending my days composing and rehearsing in a surreally wintry environment, behind glass, as part of an art installation in collaboration with Elkhanah Pulitzer and Chad Owens. For those of you in San Francisco, it’s at 296 Ivy St. Stop by anytime. I’ll make tea. Happy Holidays! 4 months 1 week ago. Here is a wonderful short doc about Junkestra, created by Nosrat Tarighi for the The John F. Kennedy Center for the Performing Arts' Digital Stage series. Nosrat and his colleague Joy Yi filmed everything from rehearsals to dumpster-diving during my week at the KC earlier this year. Special thanks to Recology for their unflagging support of recycled art, Mason Bates for the invitation to represent CA at the KC, Oliver DiCicco and John Jaworski for making the instruments road-worthy, and the amazing players of So Percussion for putting up with my junk :) 4 months 2 weeks ago. 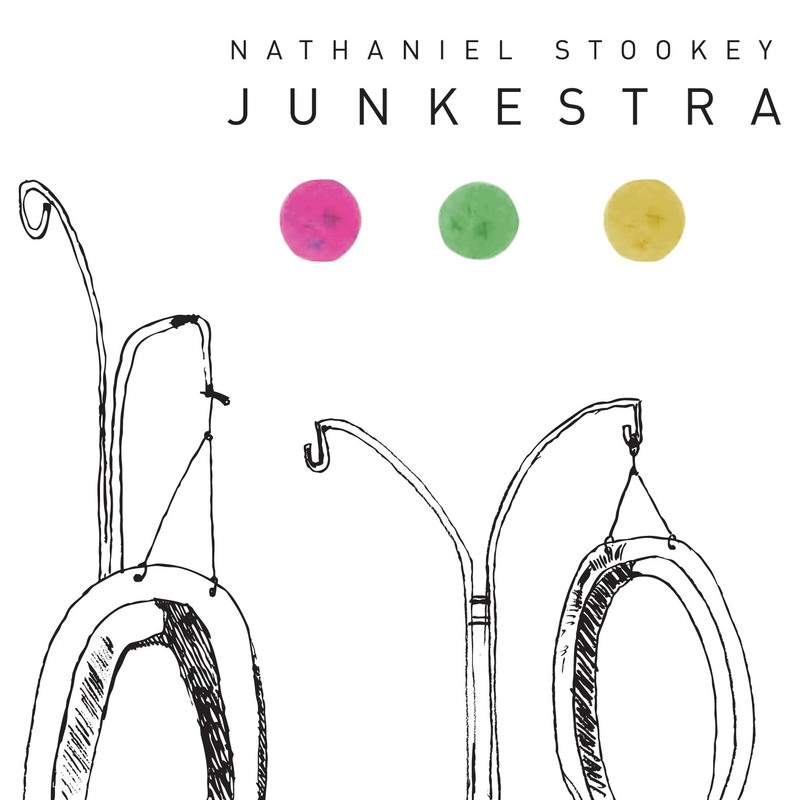 It's probably safe to say that Nathaniel Stookey's Junkestra is the first composition created and premiered at a city dump to be subsequently programmed by a major American orchestra. But then Junkestra is not your average piece of garbage. Following multiple performances to capacity crowds, the work was moved to the thousand-seat Herbst Theater in downtown San Francisco where, as one blogger reported, 'the performance received a standing ovation from the sold-out audience, and when the composer offered to play the last movement as an encore, the audience cried out to play the whole piece again, which they then proceeded to do.' [sfciviccenter.blogspot.com]. The work has been presented many times since, limited only by the daunting task of transporting a stageful of garbage. In 2009, it was performed twelve times over two days as the featured work at the opening of the new California Academy of Sciences and Music Concourse in San Francisco. In 2010, the work had its San Francisco Symphony debut at Davies Symphony Hall, conducted by Donato Cabrera. The new recording is performed by members of the San Francisco Symphony Youth Orchestra, conducted by Benjamin Shwartz, and featuring David Weiss on saw. It includes a dance remix. "Junkestra," which is in three movements, is a surprisingly melodious concoction, ...sometimes reminiscent of Indonesian gamelan music, with episodes of jazz and minimalism spliced in. You'd have just cause to be skeptical of Nathaniel Stookey's Junkestra, a three-movement, 11-minute work performed on objects made from garbage found at a San Francisco waste transfer facility. But instruments don't make music, people do, and Stookey's short work for instruments created by him and his mother ... is a concise, rhythm-heavy work of considerable emotional scope. The second movement is especially lovely—a moody postindustrial gamelan. Delicate yet blunt, like a battle scene by Fabergé, Junkestra mines metal and glass trash for textures suggesting precious metals and uncut jewels. This gorgeous music will make you want to grab your drumsticks and dash to the dump. It’s true: San Francisco’s garbage company has an artist-in-residence program. That’s how composer Nathaniel Stookey came to write “Junkestra,’’ a bright, bumptious, 15-minute opus for a percussion orchestra fashioned solely from recycled trash. The piece, all interlocking grooves and clanging asides, is easygoing and loose-limbed, a kind of rose-colored industrial jam. The almost unavoidable timbral echoes of gamelan or Harry Partch’s DIY modernism are subsumed into a pop-art surface — an affinity made explicit on this EP release with an added “dance mix’’ that only blunts the original’s charm in its translation into four-bar phrases. The best is the slow movement, with the inimitable sound of a musical saw (David Weiss) anchoring a keening, eerie landscape that’s equal parts ominous haze and retro, low-tech special effect. Stookey offers a diverting spin on throwaway culture. "Sulla scia dei vari Harry Partch, Lou Harrison e altri autori della West Coast, Nathaniel Stookey ha costruito la sua piccola orchestra di strumenti a percussione recuperando i materiali più disparati dalla spazzatura (‘junk’ significa per l’appunto ‘rottame’); e ha poi scritto una breve composizione (un quarto d’ora circa) per questo singolare organico, dal titolo Junkestra. Il risultato è quello che ci si può aspettare: sonorità da gamelan indonesiano, ritmi incalzanti in stile minimalista, echi jazz e pop, appeal immediato. Un gustoso assaggio della musica di Stookey, del quale si spera arriveranno nuove creazioni per la sua affascinante orchestra di rottami." The instruments involved give out a sound halfway between a gamelan orchestra and some of the impromptu sounds I would get in my youth when I dragged my mother's pots and pans out of the kitchen and went to work. The sound is exotic, yet familiar in that way. [A]n important addition to the percussion repertory. A great listen!